Dynatone Corp. displayed its products at 2014 NAMM International Music Expo held in Anaheim, California from January 23 to January 26, 2014. NAMM Show, held every January, arranged by National Association of Music Merchants, founded more than a hundred years ago by American musical instrument merchants, an international exposition in which most of musical instruments manufacturers worldwide, more than 1500 companies exhibit their products and attended by more than 80,000 visitors consisting of music merchants, their employees and various artists, is one of 3 largest musical instruments exposition in the world, along with Frankfurt Musik Messe and Shanghai Music International Festival, where you can see the newest development and the global trend of musical instruments manufacturing. 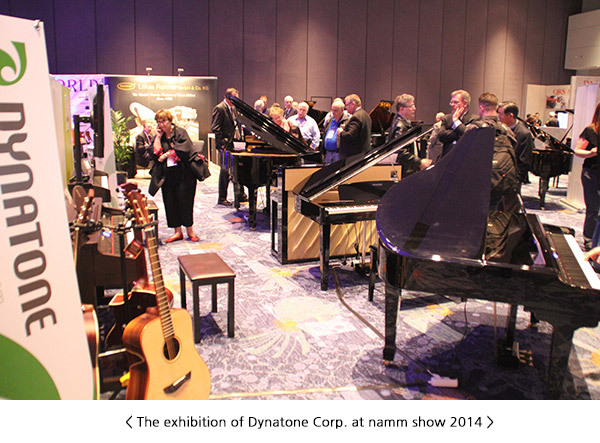 Dynatone Corp. in cooperation with Dynatone America Corp. which was established in October, 2013 to support the marketing of Dynatone products in North America, displayed its flagship model, self-playing digital grand piano, VGP-3000 and other 7 models at this NAMM Show. Dynatone Corp., in its effort to increase its market share in North America in balance with its European market, has been displaying at this NAMM Show from 2006 every year, increasing its market share and in October, 2013, it established a California corporation for the marketing of its own brand “Dynatone?by providing dealer friendly customer service. To enhance the consumers trust in the brand, Dynatone Corp. is concentrating its marketing of high-end quality products directly with musical instrument dealers only at its first stage of marketing and will gradually expand its marketing of supplying consumer oriented products. Previous Dynatone will attend 2014 NAMM show in Anaheim.